LONDON, England (CNN) -- Britain's Prince Charles has converted his 38-year-old Aston Martin to run on biofuel made from surplus wine, his office revealed Tuesday. 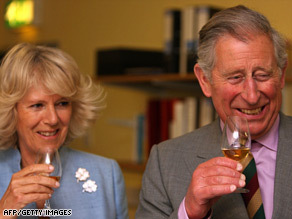 Prince Charles with Camilla, Duchess of Cornwall, on a visit to a whiskey distillery in Northern Ireland last month. The car was a 21st birthday present from Queen Elizabeth, and the prince has converted it to run on 100 percent bioethanol as a way to reduce his carbon emissions, his office, Clarence House, said. The prince has also converted his other cars -- several Jaguars, an Audi and a Range Rover -- to run on 100 percent biodiesel fuel made from used cooking oil, his office added. Details of the prince's biofuel use were made public Monday in his household's 2008 Annual Review, which details the prince's income and activities over the past year. The report says Charles and his household reduced their carbon footprint by 18 percent last year after switching to green electricity supplies and reducing their travel-related emissions. Charles, 59, has a strong interest in environmental issues and rural affairs. He is active in environmental charities, and his food company, Duchy Originals, uses ingredients produced at his organic farm in Cornwall, southwestern England. The biofuels are converted and provided by Green Fuels Limited, a British company that previously provided biodiesel to power the royal train, Clarence House said. The wine used for the bioethanol comes from current vintage that remains after English wine producers reach the EU limit for annual wine production, a spokesman for Green Fuels said. The prince uses wine from a vineyard close to his Highgrove Estate, the spokesman said.